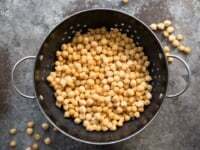 I absolutely love chickpeas, also known as garbanzo beans. These protein-packed legumes have a mild, nutty flavor that goes well in a variety of dishes, including hummus, soups and stews. 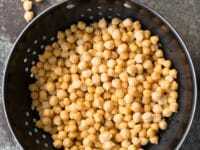 Because of the time involved in preparing dried chickpeas, most people resort to canned varieties. The trouble with canned chickpeas is that many contain additives for preservation, as well as high sodium content from added salt. 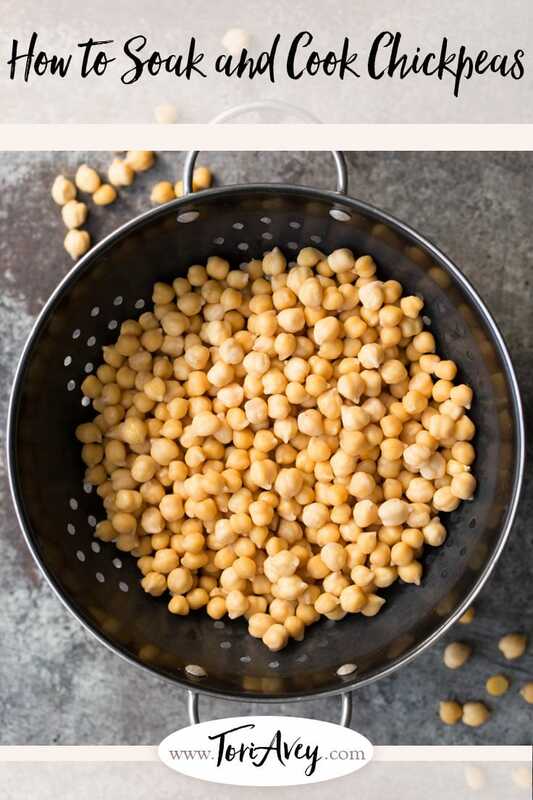 Making chickpeas from scratch is a much more natural and healthy way to go, and it’s surprisingly easy. This recipe, photo tutorial and video will show you the whole process, step-by-step. 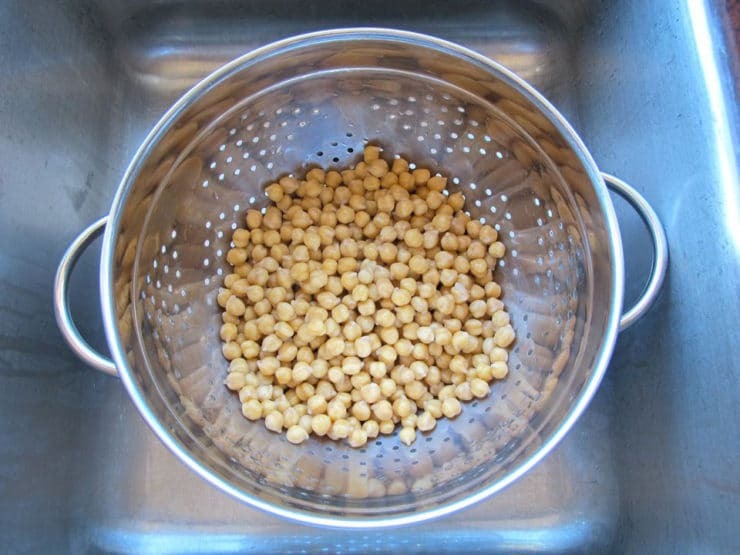 Here is a simple method for quick-soaking and preparing chickpeas for recipes. 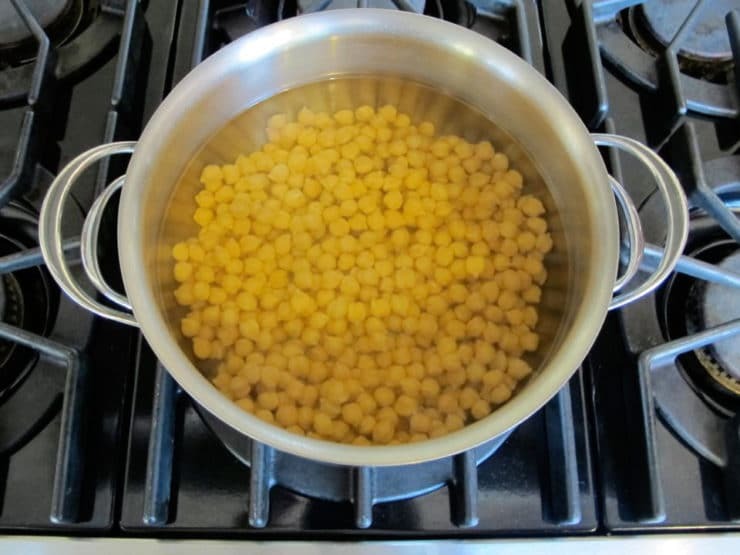 Chickpeas are soaked before boiling for two reasons – one, they need to be softened before they boil, and two, pre-soaking helps to make the beans more digestible. You can soak them quickly, as described below, or overnight if you prefer. My friend Gila Ronel, a doula and holistic nutritionist in Israel, soaks the beans for a couple of days until they begin to sprout. She says that the nutritional value improves when the chickpeas are sprouted. If you try this, you’ll need to use cold water, not the quick soak method. Make sure you change the water they are soaking in twice daily to keep bacteria at bay. When shopping for your chickpeas, make sure you use a bulk bin with a high turnover rate. The older the chickpeas are, the less tender they will cook. Beans that have been sitting in a pantry for a year or longer tend to go stale and will not cook up as nicely. Most recipes call for chickpeas that have been soaked and boiled until tender (falafel is one notable exception– chickpeas should only be soaked for falafel, not cooked). 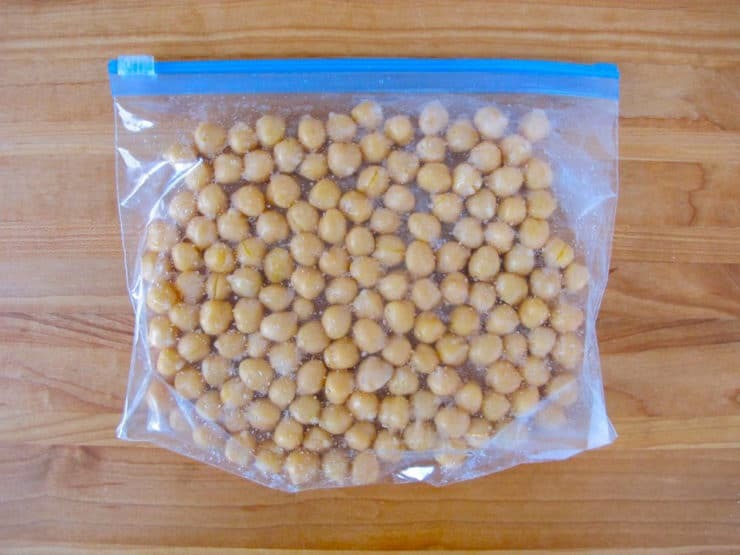 I often make a large batch of cooked chickpeas, then refrigerate or even freeze for future use. I have covered the instructions for storing and freezing below. 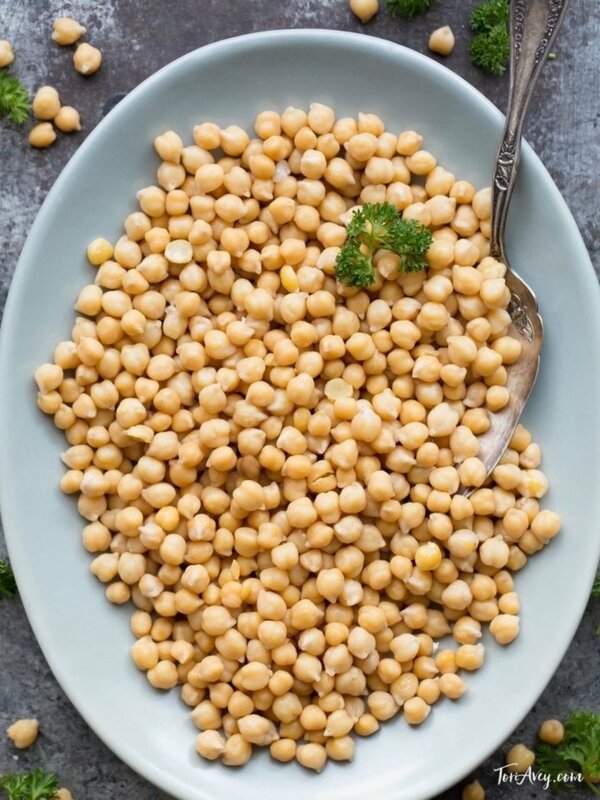 You will notice that home-prepared chickpeas taste much better than the canned variety, and you’ll have more control over the salt content. Preparing the beans this way is also more affordable… you’ll save over 50% by preparing them yourself. Frugality rocks! 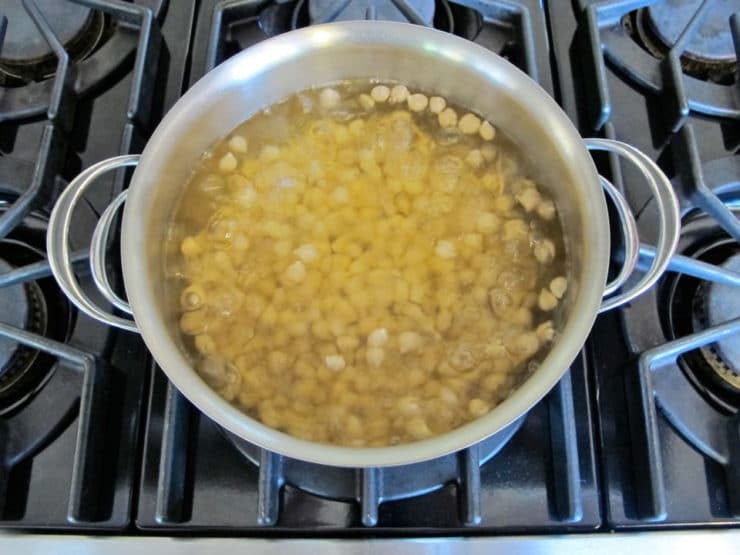 Learn how to soak and cook dried chickpeas or garbanzo beans to prepare them for use in recipes. Includes how to video, storage and freezing techniques. You will also need: a large 8-8 quart pot, colander. Before cooking, you will need to soak the beans. You can soak them overnight, if you have the time. Place them in a large bowl and cover with cold water. The chickpeas will expand to over double their size, so make sure you cover by several inches of water to allow for expansion. Cover the bowl with a clean towel and let them soak overnight. Drain the water and rinse the beans before cooking. To quick soak the beans, you will need 1 hour. 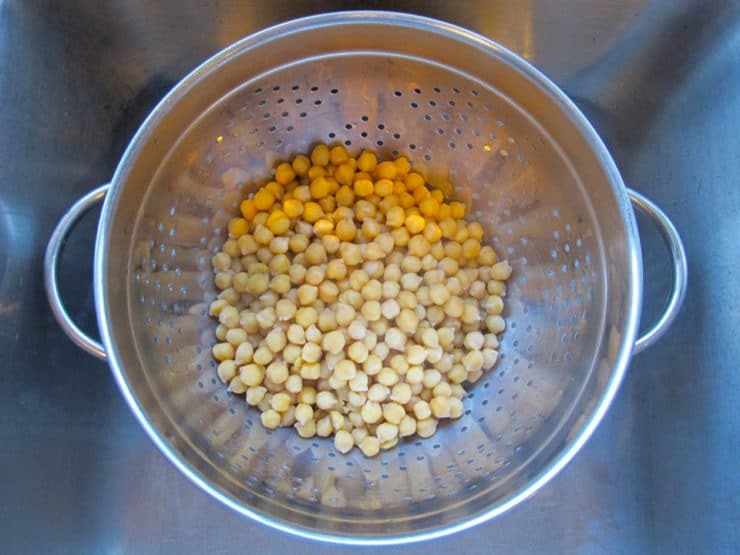 Place the chickpeas into the bottom of a large pot and cover with water. The chickpeas will expand to over double their size, so make sure you cover by several inches of water to allow for expansion. Bring the chickpeas to a boil. Let them boil for 5 minutes. Remove from heat. Let the beans soak in the hot water for 1 hour. Drain the water and rinse the beans before cooking. When you are ready to cook your soaked beans, place them in a large pot and cover with several inches of water. I use about 1 quart of water per 1 cup of soaked beans. Bring to a boil, then reduce to a simmer. Add salt, if desired. I use about 1/8 teaspoon of salt for every 1 quart of water and 1 cup of soaked beans. You may like more salt to taste, or none at all to keep them "au naturel." Let the beans cook for 60-90 minutes until desired tenderness. Certain dishes require very tender beans (like hummus), while other dishes call for firmer beans (like stews and soups that need to be cooked over long periods of time). Adjust cooking time to achieve the desired tenderness for your purposes. If you are freezing the beans, keep in mind that they will freeze best if they are on the firmer side, rather than completely soft. As you cook them, the beans will continue to expand a bit. Keep an eye on the water level and add additional water as needed to keep the beans covered. 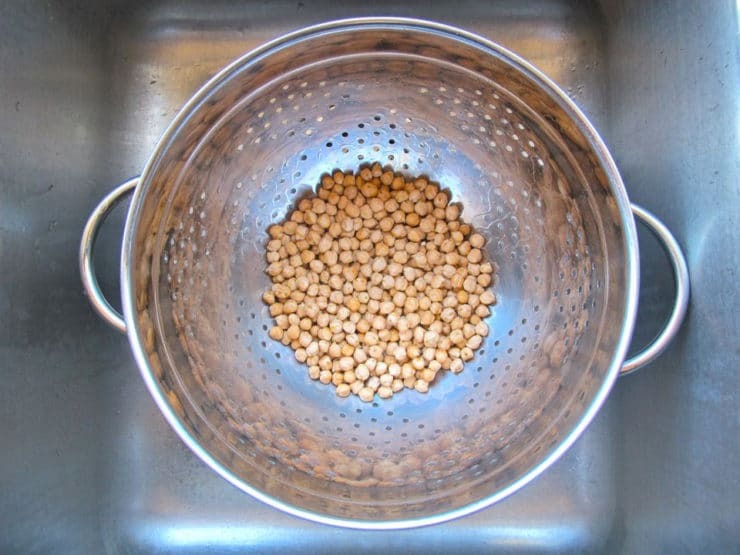 When the beans are fully cooked, drain in a colander and allow to cool. To store cooked beans in the refrigerator, place them in a covered airtight container or a plastic zipper bag without any additional liquid. Cooked beans will keep 3-4 days in the refrigerator. To store the beans longer for future use, freeze them. Remove as much moisture as possible from the beans by patting them dry with paper towels. Place the beans in Ziploc bags spread out in single layers; you don't want to pile the beans on top of each other or they will stick to each other. Freeze, laying the flat single layer down to keep the beans from freezing together. You can freeze several bags this way, one laying flat on top of another. Alternatively, you can spread out the beans in a single layer on a baking sheet lined with parchment and freeze the beans for 30 minutes. 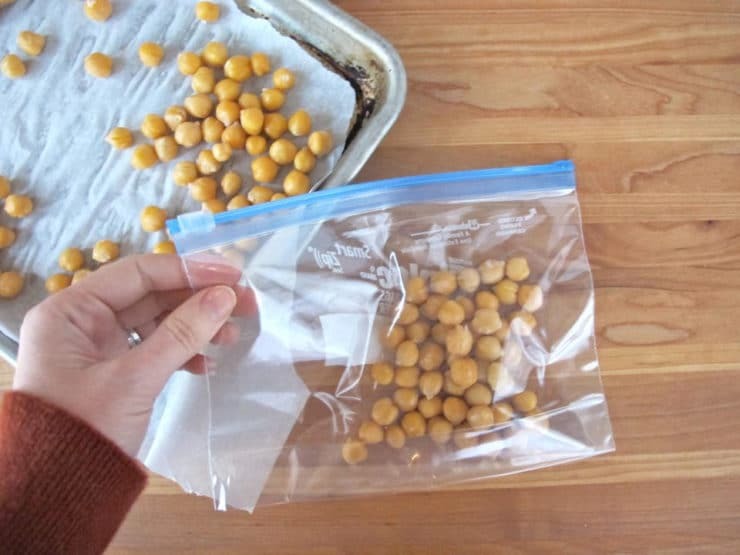 Once they are firm, pour them into a plastic zipper bag or airtight container, seal, and put immediately back into the freezer. 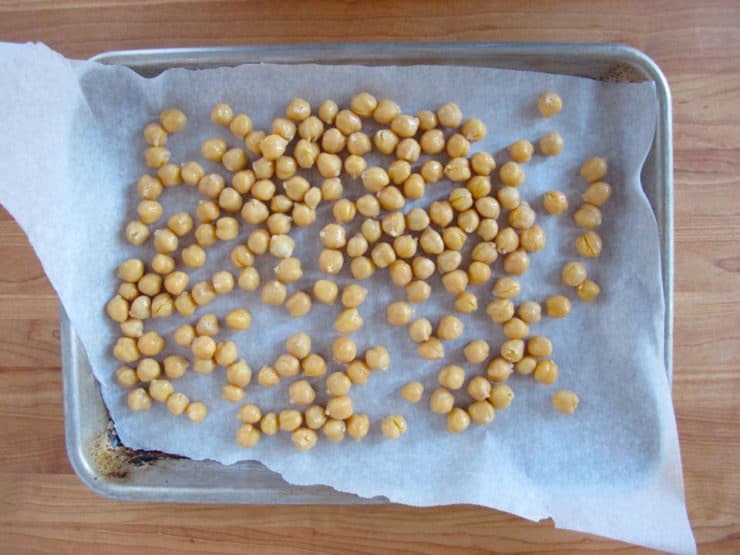 Using this method, you don't need to put the chickpeas in a single layer-- because they are already half frozen, they will not stick together. Frozen beans will keep for up to 1 year. 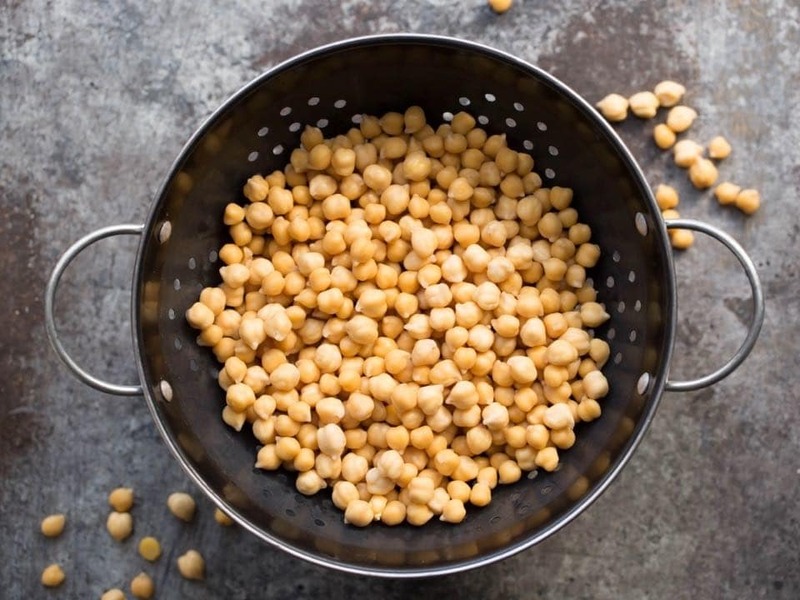 Nutritional information per serving is for 1 cup of cooked chickpeas (1/3 cup dried chickpeas)– values and cook times will vary based on how what cooking method is used. 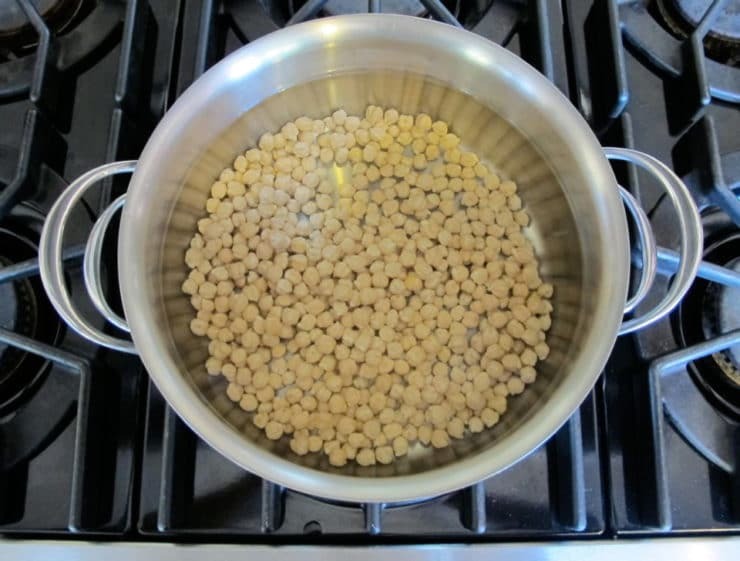 Thank you Tori Avey for your very concise and thorough step by step method to wash, soak, prepare, and cook the chick peas or garbanzo beans! Is exactly what I was looking for! As a grandma I feel I can tell you that you “sound” as sweet as you are beautiful! I covered the pot to boil and soak the garbanzo beans. What do you think about cooking them in a pressure cooker? Hello! If I am freezing firmer beans, do I need to cook them longer after they are defrosted in order to make hummus? 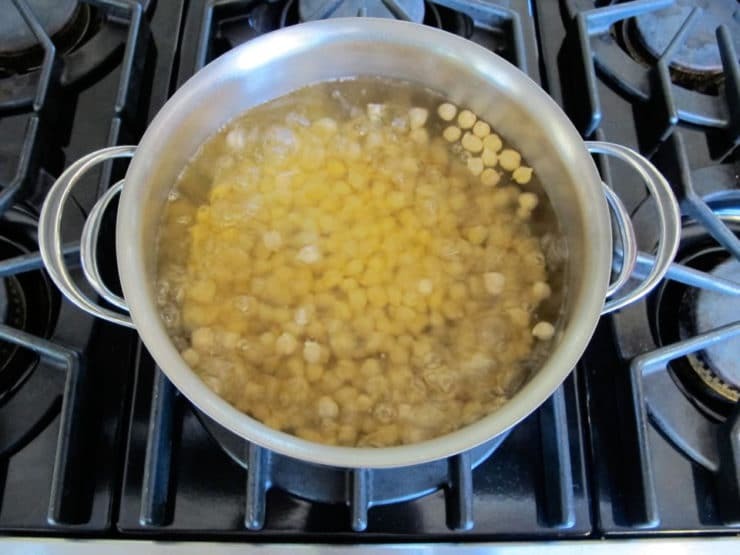 Do you need to both soak and boil chickpeas before you roast them. i usually soak chickpeas with salt overnight for about 10 hours. rinse it the next day, put it into a pot with water, bay leaves, turmeric powder, salt, cumin seeds and black pepper powder and baking soda. cook its according how you like it. i eat it as a snack very often. i love it. 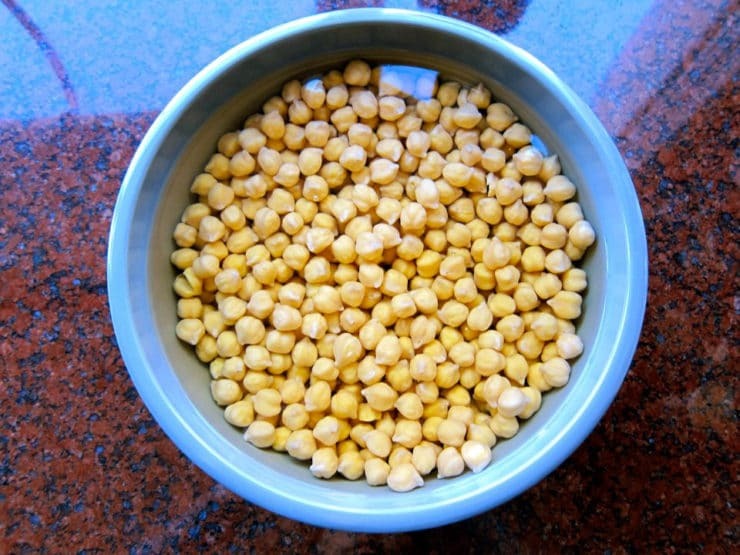 a friend of mine from india gave me his way of boiling chickpeas. i tried and just love it. i found it to be the most tastiest way of boiling chickpeas as a snack. Those are steps for the quick soak method. The rationale is that a quick boil, then a 1 hour soak, will soften the beans in much the same way that a long overnight soak in lukewarm water will. I hope that clarifies? Soaking beans helps eliminate some of the phytic acid. To maximize the amount of phytic acid lost, soak beans for a minimum of 12 hours, suggests the Weston A. Price Foundation. Drain and rinse the beans several times during soaking to get rid of the phytic acid that has leached into the water. If you add a bay leaf, a pinch of salt and some pepper, and a clove of garlic when you cook the chick peas then, the broth they are cooked in makes a great soup base. Thank you so much, Jane. Are the proportions of spices you present what I should use for each cup of soaked beans and quart of water? Boil a pot of water, toss in chickpeas, turn off heat and let sit for 15 minutes (this is a “hot soak”). In the mean time bring a second pot of water to boil and add 1/2t of baking soda per cup of water. When the hot soak is done, transfer the beans to the pot of boiling soda water and boil for 5 to 10 minutes. Strain and chill in cold water. Now rub them with your hands to release the skins. The 5 minute boiling time goes with beans that you will use on a salad or in a curry where you want whole beans in the end dish. The 10 minute boiling time goes with anything where you don’t care if the beans are split in half or not (i.e., hummus). The longer boiling time makes the skins come right off. The shorter boiling time requires a little more work to release the skins (still an easy 10 minutes for 200g of dry beans) but I have found that only about 10% of them split when you do it that way. In either case you still have to soak and cook the beans after you have removed the skins. I have found that steaming the skinned chickpeas for 24 minutes after an 8 hr soak in cold water is enough even if you use the 5 minute boiling time. I have not tried the soda in a dry frying pan approach (yet).